HELP Hover the mouse pointer over the links on the left (general, the head etc. ), and you ought to see pictures and text changing. Keep the pointer over the part you wish to see. Clicking on a link will bring you to a page with more information and pictures. 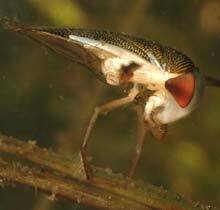 If it doesn't work right or you find this too cumbersome, then click on on the word HERE in the line higher on this page general As a true bug the lesser water boatman is somewhat flat, though the body is highly adapted to the life it leads in the water. 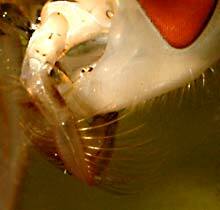 When the shields and the wings are extended, the body does remind to that of a tiny fly. When submerged it looks more powerful by the surrounding bubble, which also streamlines the total profile. the head The head is relatively large with big facet-eyes and sits as a streamlining helmet in front of the body. The head ends below in the short, ribbed snout. The front, the face (frons) as you might say, has a groove at some species. 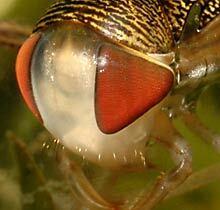 The antennae are almost not present, and hidden behind the eyes. The neck is thin and protected by the shield which is attached behind the head. the chest In the chest (thorax) are breath openings (stigmata), in some species a pair may be transformed in a hearing organ. To each of the three segments of the chest is pair of legs attached. The three pairs are totally different. front legs The front legs are short, the foot (tarsus) is broadened and equipped with long hairs. With its front legs the lesser water boatman whirls up the garbage layer (detritus) on the bottom, while the hairs sieve the material out, which is then brought to the snout in search of nourishment. 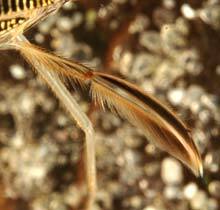 On the thigh (femur) of each front leg the males of some species have short thorns, which where erroneously thought to be used for making sound (stridulation). 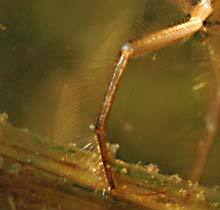 mid legs The legs of the second pair, are relatively long and sparely haired, and end in strong claws, with which the insect attaches itself to its resting place. hind legs The third pair of legs provides the propulsion: the end part is broadened en flattened and equipped with two seams of long hairs, which flap out with the back stroke, providing a wide surface and flap in at the front stroke, thus giving much less resistance and braking as little speed as possible. abdomen The body (abdomen)is flat and relatively small. 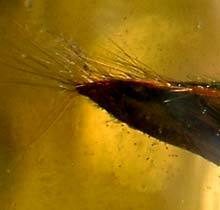 At the endpoint are long hairs protruding, possibly acting as a kind of "kite tail" for balance, and probably having a function to help the insect piercing the surface film while taking air. front wings The coloured front wings are a bug's (hemelytra) which means half hardened, but with Corixa this does not mean that a part is membraneous, see the picture. 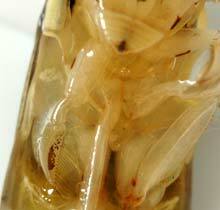 The front wings are used as cover and under these the second, total membraneous wings are kept folded up. With the second pair the insects flys. 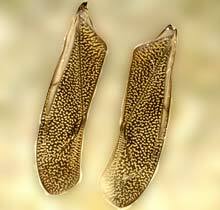 Between the two wing pairs there is a thin layer of air. On the next page: the life of Corixa and how its structure relates to that. ← Hover with the mouse pointer over the links..